Trastevere is a picturesque medieval area located on the west bank of theTiber. The area escaped the grand developments which changed the face of centralRome, and is a charming place to wander, eat or relax. Trastevere (TrasTEVeh-ray)is named for its position ‘over theTiber’. Separated from the heart of centralRomeby the river, the area retained its narrow lanes and working-class population when the rest ofRomebegan its nineteenth-century expansion. Tourists are charmed by Trastevere, although they descend in numbers which slightly obscure the area’s personality. From being the last surviving pocket of earthy medievalRome, the neighbourhood has also become unique inRomein attracting a crowd of young crusty-locked foreign beggars, buskers and alcoholics. Internet cafes are side-by-side with gloomy ancient premises of uncertain function, and you can choose from trendy bars and traditional chocolate shops. Still, despite the influx of foreign money, Trastevere still maintains a strong local identity The heart of Trastevere is Piazza diSanta Mariain Trastevere, a pedestrianised square piazza lined with restaurants and pricey bars, faded palazzi, and thechurchofSanta Mariain Trastevere. The steps surrounding the pretty central fountain are a popular hang-out spot for a non-typical crowd (watch out for unwashed jugglers). Heading up the lane to the right of the church, and choosing one of the right-hand turnings, you enter into the maze of narrow lanes at Trastevere’s heart. Plants scramble down walls from garden terraces, washing hangs out to dry, and chipped Virgin Marys look down from shrines on street corners. 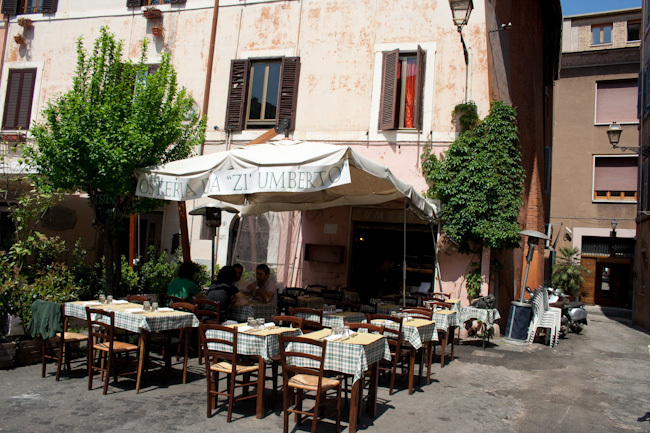 The streets close to the river and south of Viale Trastevere are much quieter and there are several unpretentious restaurants where you can enjoy a peaceful meal at an outdoors table. ThechurchofSanta Ceciliain Trastevere is one ofRome’s more interesting churches. The statue by the altar is based on the body of the patron saint of music, martyredSt.Cecilia, which was found undecayed in her coffin in the sixteenth-century. From here, it’s a short walk to visit the Isola Tiberina (TiberIsland). There are lovely lanes to explore, and it’s not too difficult to step off the main routes and escape the masses. As well as the occasional touch of authentic local colour, there are plenty of businesses aimed at the large foreign population (strongly American and French).Rome’s principal foreign-language cinema is located here, as well as countless restaurants, popular with both Romans and tourists. There are also lots of stylish bars – most are fairly new, but still atmospheric. It’s a lovely area to wander in the soft dark of a Roman evening, with a more intimate feel than the palazzi-filled Centro Storico. Trastevere is a short walk from LargoArgentinain the Centro Storico – alternatively you can take tram number 8, and descend at the first stop over theTiber. There’s no Metro station nearby. Carlo Alberto Salustri (Rome, 1871-1950) was an Italian dialect poet, better known by his pen name of Trilussa (an anagram of “Salustri”). He is best known for the poems, some of them sonnets, written in the dialect of Rome.Trilussa lived a very poor childhood, as his father had died when he was only three years old. After irregular studies, he made a very early poetical debut in 1887 on the Rugantino magazine directed by Alfredo Zanazzo. Later he wrote also for Don Chisciotte, Capitan Fracassa, IlMessaggero and Il Travaso delle idee. His first collection, Le stelle de Roma (“Rome’s Stars”), is from 1889Trilussa’s fame grew in the 1920s and 1930s, though he was not a part of any literary circle, preferring to be in the streets and taverns, which were the source of his inspiration. His poetry features the petite-bourgeoisie of Rome: the housewife, the store clerk, the servant, but also contain strong satirical denounces against governments and the vices of rich people. Some of the sonnets are Aesop-like moralistic fables. Trilussa’s own sketches and drawings were featured alongside his poetry.A very popular person in his city and Italy, Trilussa was named Life Senator on December 1, 1950, by the Italian President Luigi Einaudi. He died twenty days later.In the work known as Illustrissimi, a collection of letters written by Pope John Paul I when he was Patriarch of Venice, Trilussa is one of the recipients of the letters. Piazza Trilussa get the name from this important roman poet. If you are looking for the authentic tastes of tradition, high quality and warm atmosphere in the family, the inn from Zi’Mberto you are always welcome. Located in the heart of Trastevere, in Piazza della Malva, charming place just behind Piazza Trilussa, this delightful restaurant opened in the 60’s is now managed by Paul, whose passion for high quality and authenticity, is the real highlight of ‘entire management. The particularity of this place it can take already teaching the same: a wooden hand-written and set among the branches of a tree, very rustic way that represents the very identity of the place, simple yet original. Here the rush and stress do not like and waiting can turn into a moment of pleasure, while enjoying a glass of wine. The philosophy has always married the landlord is to make every customer feel at home. There will often, in fact, to see him sitting next to you for a chat or simply to offer a coffee or a bitter end pasto. Ciò Zi’Mberto tavern that makes really unique is the ability to meet all the tastes, “pampering” products with every taste of Italian origin, fresh and genuine. The menu is mainly based on typical dishes of Roman and imaginative variations, fruit of the host, able to enrich even the most simple dish with the colors and flavors of the best seasonal produce. Among the specialties of the house you can not fail to taste the sweets, the famous pumpkin flowers and fillets of cod in batter, the result of long experience. Product quality, price and honesty “home atmosphere” are the main ingredients of Zi’Mberto, with the simplicity that manages to make each dish special.